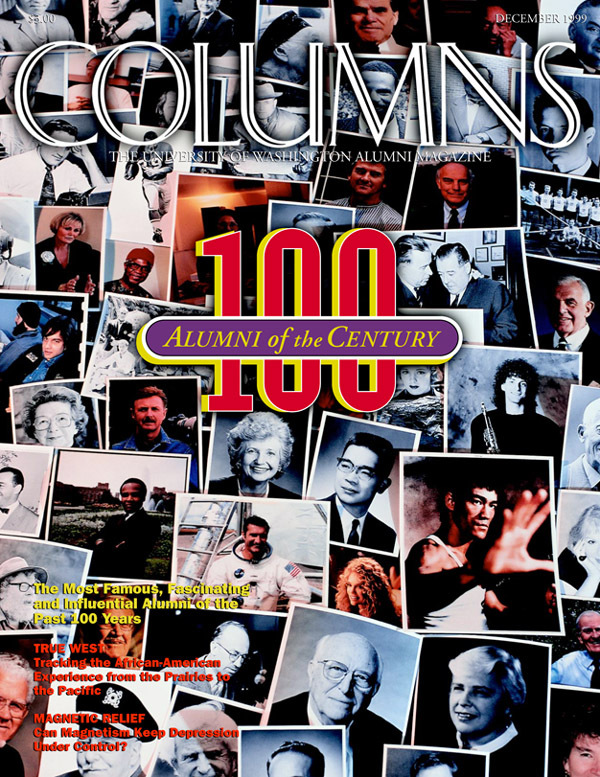 "100 Alumni of the Century" is a list of the most famous, fascinating and influential UW graduates of the 20th century--including reader reaction to the list. Also a look at the African American experience in the West, and new research into magnetism and depression. "Against All Odds" is the life story of Rep. Tom Lantos, '49, '50, the only Holocaust survivor to serve in Congress. Also featured: the UW entrepreneurship program, research into microbes and heart disease, and readers choose their favorite professors. My Favorite Teacher: Nine writers recall their most memorable professors. Also, medical help for international adoptions, a profile of Alumnus of the Year Jim Ellis, and the Best of 1999--awards to top teachers, alumni, staff and volunteers. Blooms in Doom: Can the UW Save the Quad Cherries? Also, the impact of I-200 on the UW, the search for life on other planets, and the hiring of Football Coach Rick Neuheisel.